While the name "Persia" (Western historical name of Iran) has attracted tens of thousands of people from around the world to London's British Museum to visit ancient Persian artifacts, the Nuremberg-based music company, Colosseum, invites Europeans to listen to eight masterpieces of Persian symphonic music. Ali Rahbari, who recently resigned from his job as the principal conductor of the Tehran Symphony Orchestra, with financial support from Persian (Iranian) Ministry of Culture and Art, in the late 1970s recorded works by Persian contemporary composers, Hossein Dehlavi, Aminollah Hossein, Mohammad-Taghi Massoudieh, Ahmad Pejman, and one of his own compositions. These pieces were released as three LPs in Germany in 1980, entitled, "Symphonische Dichtungen aus Persien" ["Symphonic Poems from Persia"] which, for some reason, were not imported to Persia (Iran). Fortunately, after a quarter of a century, Colosseum decided to release those LPs as a double CD album. 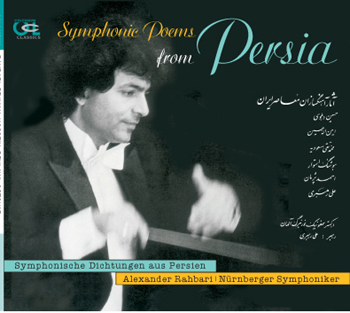 "Symphonic Poems from Persia" is the first collection of Persian symphonic music masterpieces available worldwide. Such pieces such as the valuable collections recorded by Manouchehr Sahbai in Austria and Bulgaria in the 1990s have been distributed locally. 1. "Persian Mysticism around G" by Ali (Alexander) Rahbari, who is one of the greatest Persian conductors. This work was originally called "Persian Blood around G". "Strauss has a piece called 'Wiener Blut' (Vienna Blood). When I used 'Blood' in the title of my piece some Europeans recalled that work, so I changed the title," Rahbari said. "This work really sounds Persian. I tried not to use Western harmony rules, and mostly used counterpoint." "Persian Mysticism around G" received its first performance by the Vienna Musicians Symphony Orchestra in 1977, and then by the Tehran Conservatory Symphony Orchestra at Tehran's Roudaki Hall. Ali Rahbari was born in 1948 in Tehran and studied violin and composition with Rahmatollah Badiee and Hossein Dehlavi at the Persian National Music Conservatory. He continued his studies at the Vienna Music Academy with Gottfried von Einem and Hans Swarosky. In 1977, he received the first prize of International Conducting Competition in Besanson, France, and one year later the silver medal of the Geneva Conducting Competition in Switzerland. In 1979, Rahbari was invited by Herbert von Karajan to conduct the Berlin Philharmonic Orchestra as a guest conductor, and from 1988 to 1996 he was the permanent conductor of Belgian Radio and Television Philharmonic Orchestra in Brussels. Rahbari has conducted some of the most famous orchestras around the world such as the Vienna Symphony, French National Orchestra, Czech Philharmonic, London Philharmonic, etc. 2,3,4 Three pieces by Ahmad Pejman, entitled "Dance," "Ballet-Impressions," and "Rhapsody." "Dance" is an extract from an opera in Persian, commissioned by the Tehran Opera in 1976. It is a dance of villagers with a folkloric character, making use of extremely interesting rhythms borrowed from Persian Music. "Ballet-Impressions" was commissioned by Roudaki Hall in 1973. Two soloists from the Berlin Opera took leading roles in the premiere. Written while he was studying in Vienna, Pejman's first symphonic work, "Rhapsody," was performed by the Vienna Radio Orchestra conducted by Heinz Sandauer. Ahmad Pejman was born in 1937 and studied composition with Hossein Nassehi in Tehran. The Ministry of Culture and Art granted him a scholarship to continue his studies in composition at the Vienna Music Academy, where he was taught by Thomas Christian David, Alfred Uhl and Hans Jelinek. For the opening night of Roudaki Hall (the Tehran Opera House), Pejman was commissioned to write the "Delaavar-e Sahad," which is the first serious opera in the Persian language. Among his other works are: "The Persians Overture" and "Ayaaraan" (for Persian instruments). 5. "Sheherazade" (Shahrzad), in seven movements, is by Aminollah (Andr�) Hossein (1906-1984), the first Persian composer who was able to present his works in international concerts. He completed his studies at the Paris Conservatory, and his first work, the ballet "Toward the Light," was performed in 1938 at the Paris Opera House. Hossein's most famous works are: "The Ruins of Persepolis" and "Persian Miniatures," which demonstrate his deep love for the ancient culture of Persia. But his "Sheherazade" has a more Arab than Persian character, like what we hear in Hollywood movies about ancient Persia that erroneously portray Persia as part of the Arab world and culture! Ironically, the Russian composer Rimsky-Korsakov's Shaherazade sounds more Persian than the Persian composer Hossein's Sheherazade! The actor Robert Hossein is Aminollah Hossein's son. 6. "Bijan & Manijeh" (in six movements) by Hossein Dehlavi. Originally in 26 movements, this work was performed for the first time in 1975 at Tehran's Roudaki (Vahdat) Hall as a ballet. Some of the other movements of "Bijan & Manijeh" were recorded by the Vienna Radio Symphony Orchestra, conducted by Thomas Christian David in 1977. This work is based on Ferdowsi's "Shahnameh" (the national epic of Persia). Hossein Dehlavi was born in 1927 in Tehran and studied composition at the Tehran Conservatory of Music with Hossein Nassehi. He studied Persian classical music with Abolhassan Saba and, from 1957 to 1967, was the principal conductor of the Persian Fine Arts Administration Orchestra. For ten years, Dehlavi was the director of and professor at the Persian National Music Conservatory in Tehran, and Ali Rahbari was one his pupils. In 1992, with the cooperation of nearly 70 players of Persian instruments, Dehlavi established the Plectrum Orchestra. His works include several pieces for Persian instruments and orchestra, voice and orchestra, choir and orchestra, and three operas. As his contribution to the Year of the Child (1979), he wrote an opera for children called "Mana & Mani," which has never been performed. 7. 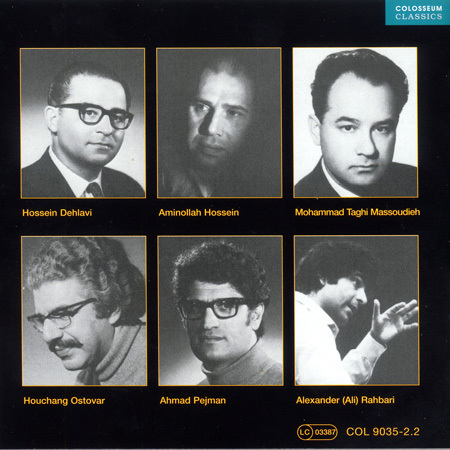 "Suite Iranienne" (Iranian Suite) by Houshang Ostovar. This piece is the only available work by Ostovar, one of the greatest Persian composers. In three movements (Pishdaramad, Avaz, Reng), the suite is composed in the Persian mode 'Chahargaah,' and was first performed in October 1973 by the Tehran Symphony Orchestra, conducted by Farhad Meshkat. Ostovar was born in 1928 in Tehran and studied basic composition with Parviz Mahmoud (founder of the Tehran Symphony Orchestra). He completed his studies at the Royal Conservatory of Music in Brussels. For many years, he was professor at the Tehran Conservatory. His works include "Sayyareh" [Planet], a ballet; "Ojaagh-e Sard" [Cold Stove], based on Nima Youshij's poems, for voice and piano; "Persian Symphonic Sketch," "Four Modes" for strings, and many piano pieces. 8. "Mouvement Symphonique" (Symphonic Movement), by the "Father of Ethnomusicology in Persia," Mohammad Taghi Massoudieh (1927-1999). This piece is written in sonata form in 1976 and was first performed in 1977 by the Tehran Symphony Orchestra, conducted by the Dutch guest conductor Jo van Diedern. Massoudieh was born in Mashhad, Persia in 1927; he studied violin, composition and ethnomusicology at the Tehran Conservatory, the Paris National Conservatory, the Leipzig Music Academy and Cologne University. His Ph.D. dissertation, entitled, "Awaz-e Sur; Zur Melodiebildung in der Persischen Kunstmusik," was published in 1968 in Regensburg. This book is among the most important books on Persian classical music in German. Some of Massoudieh's other works, such as the "Fantasy for String Orchestra" and the "Persian Suite," have been recorded by Manouchehr Sahbai with the Plovdiv Philharmonic Orchestra in Bulgaria, which is to be released soon. The new release of "Symphonic Poems from Persia" and its global distribution is an effective step for introducing Persian symphonic music.